There are benefits upon benefits to using Melt. Like the fact that there’s no cholesterol. Like being good fat that can be broken down and turned into energy. Like, tasting amazing! Melt is butter with benefits, that benefit virtually all people and all foods. 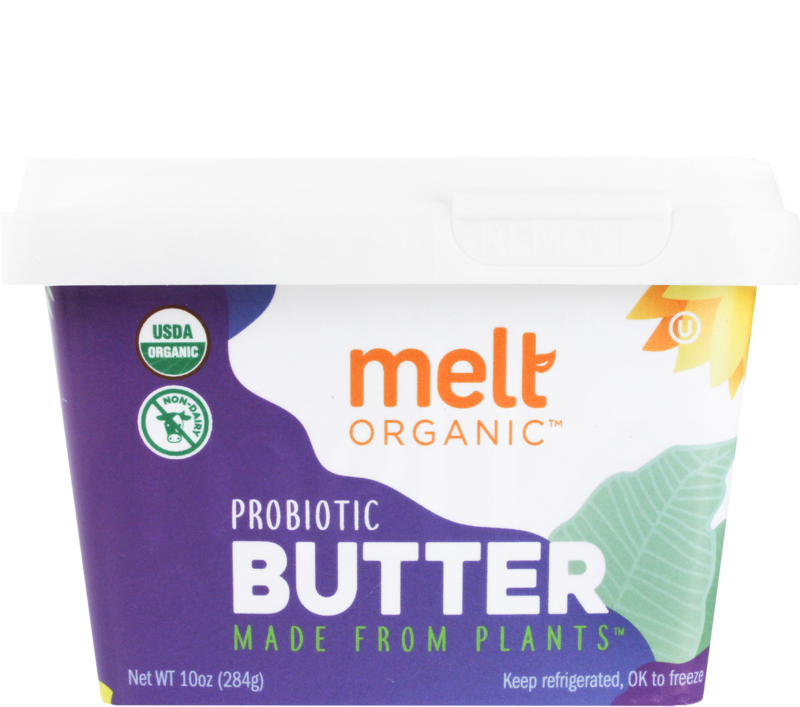 Introducing Probiotic Melt Organic Buttery Spread, that doesn’t just taste good, it also supports both your digestive health and immune system. Probiotic Melt enhances the flavor of the foods you love while delivering probiotics safely and deliciously. 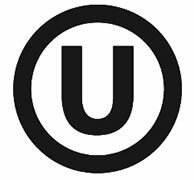 Just two tablespoons a day – spread liberally on your morning toast, muffin, bagel or waffles, it delivers 1 billion CFUs of probiotic GanedenBC30 to support your digestive health. 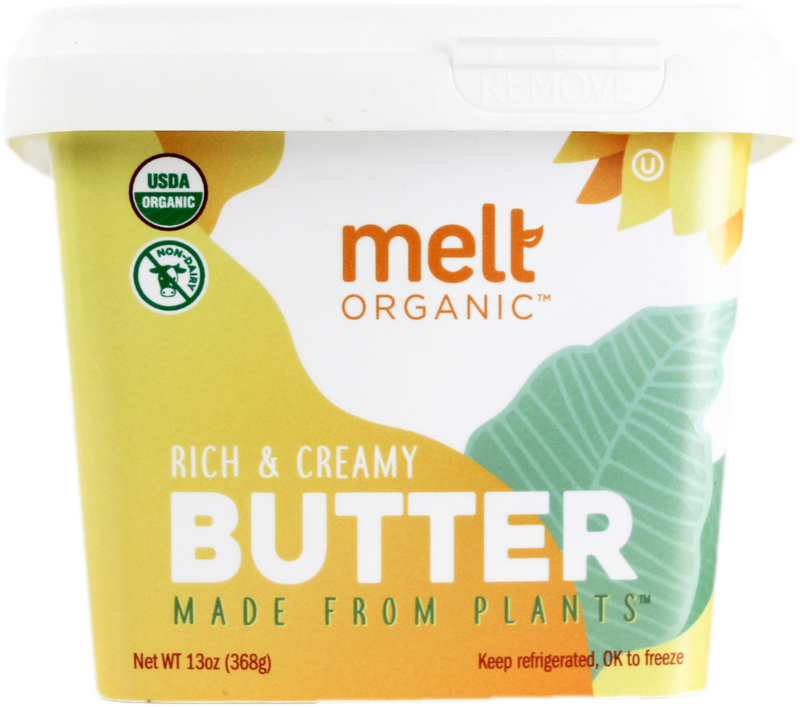 Melt Organic is made from the Perfect Blend™ of fruit- and plant-based oils. 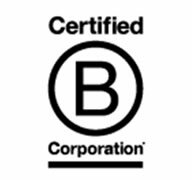 It’s dairy-free, vegan and features certified organic, non-GMO virgin coconut oil – a stable, saturated fat, and a rich fruit-based source of medium chain fatty acids (MCFAs). It cooks, bakes and melts just like butter, but with half the saturated fat and fewer calories. Rich & Creamy Melt is a rich source of ‘good fats’ with an ideal balance of Omega-6 to Omega-3 ALAs. Our butter sticks are made from a Perfect Blend™ of fruit- and plant-based oils featuring certified organic, non-GMO virgin coconut oil, with half the saturated fat and fewer calories than dairy butter. 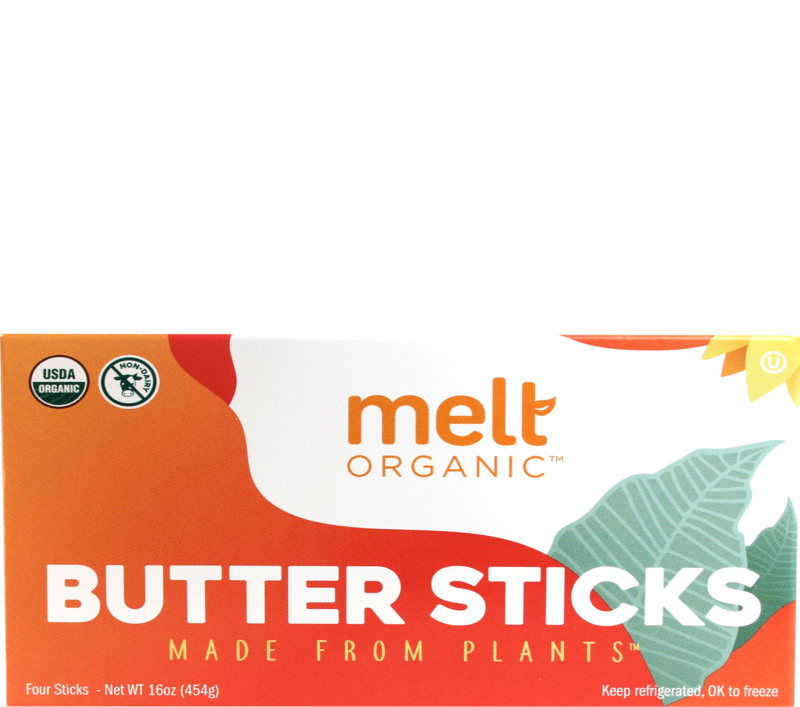 Melt Organic Butter Sticks bake and cook just like real butter and that means no measurements, no calculations and no revisions. Just replace the old with the new. The bad fat with the good fat. And the butter with butter (made from plants). 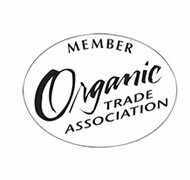 Each of our organic ingredients has been carefully chosen and combined into the Perfect Blend™ so the benefits of each organic oil are enhanced. Organic coconut oil is a good, saturated fat that keeps undesirable (LDL) cholesterol down. Research has shown that organic coconut oil can boost metabolism, increase thyroid activity, promote weight loss, and provide optimal nutrient absorption. Plus, coconut oil has a similar melt point to butter, making it ideal for baking and cooking. Produced from the fruit of the palm, palm fruit oil contains very high amounts of carotenoids, the antioxidants our bodies convert to Vitamin A. Vitamin A may also provide protection from free-radical damage that some studies have linked to cancer. It is odorless and tasteless, perfect for baking and cooking. 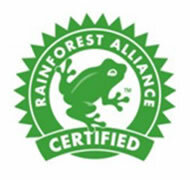 Our palm fruit oil is certified Eco-Social and Fair Trade by the Roundtable on Sustainable Palm Oil (RSPO) to ensure that it is produced both ethically and ecologically. 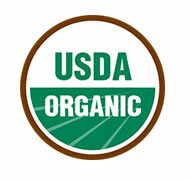 Organic flaxseed oil is one of the best sources of Omega‐3s available. Clinical research has linked life‐threatening diseases such as obesity, some cancers, heart disease, and diabetes type II with a chronic deficiency of dietary Omega‐3 essential fatty acids. Flaxseed oil has the highest plant-based concentration of Omega‐3 and can reverse deficiencies common in the American diet. 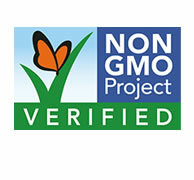 Canola oil, made from the crushed seeds of the canola plant, is a non-GMO variety of rapeseed. It is an excellent source of monounsaturated fats in the form of Oleic Acid and Omega-3 fatty acid, and Alpha-Linoleic Acid. 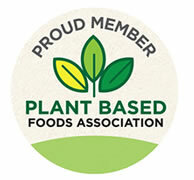 Studies show that ALA may help protect the heart through its effect on blood pressure, cholesterol, and inflammation. 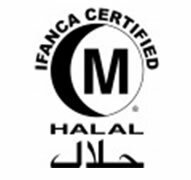 We only use organic canola oil that is expeller-pressed (hexane-free), and tested for GMOs and rancidity in every batch. Organic hi-oleic sunflower oil is composed almost exclusively of monounsaturated fat (86%), with small amounts of saturated fat (10%), and polyunsaturated fat (4%). Hi-oleic oils have enhanced fatty acid profiles making them higher in monounsaturated fats and lower in polyunsaturated fats. Hi-oleic sunflower oil is also a source of Vitamin E.